Having just finished Seeking Allah, Finding Jesus by Nabeel Qureshi, I’ve been contemplating how to review it. Scanning through the reviews on Amazon, I noticed that it is doing well. 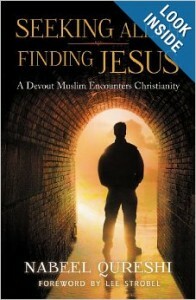 People are responding positively to Nabeel’s autobiographical account of his life as a Muslim and journey to Christ. The insight he sheds on the Muslim religion, culture, and the importance apologetics played in preparing him to truly see and trust in Jesus Christ, is both educational and uplifting. It gives a window into the difficulties of growing up as a third culture child, also showing the struggle many Muslims in the West face in a post 9/11 world. I affirm all of this, so what more could I add? Just this; after finishing the book, sniffing loudly from the tears I was shedding, I wished there was a way for me to beg, and possibly require, everyone to read it. Granted, I love books and there are many I wish everyone would read. However, this book has now reached the top of that list. As I was reading Seeking Allah, Finding Jesus certain words kept running through my mind, popping up consistently like mile markers on the highway. They became words that formed a theme for me, ones that touched both my head and heart with their joy and poignancy. These words form the basis for why I wish everyone would read this book. This book exudes grace in all senses of the word. In the Christian definition, grace refers to the unmerited favor of God freely offered and given through Jesus Christ. This grace is apparent as Nabeel recounted his devotion to God from a young age, and how God worked in his life (in both natural and miraculous ways) to bring him to a place of objective and subjective faith in Jesus. Grace can also refer to an elegance and refinement of movement. Here too, Nabeel demonstrated grace, recounting his story in a way that flowed, inviting the reader in to the movement guided by the Heavenly Father he came to know. And finally, grace can refer to an action where one gives honor or credit to someone or thing by their presence. In the pages of this book are the words of a man who bent over backwards to honor the parents he loves so dearly, as well as the God who means everything to him. This book is full of grace. This book exemplifies love. It is clear throughout that Nabeel deeply loves his family, particularly his parents. As he recounted childhood memories, I felt drawn into the love his family shared. The devotion and support both his parents showed as he grew up was beautiful to read. Nabeel showed his love for them in the way he chose to share those memories. Even when he recounted instances that were painful, he always did so with respect, careful to honor them with his words. Love for God was also evident throughout the book. The title of the book demonstrates that Nabeel’s journey convinced him that true love for God is found in loving Jesus Christ, the Son of God. It was not an easy journey, but it was the desire to know and love God that led him from Islam to Christianity. At one point, in the midst of his turmoil, he prayed, “Please, God Almighty, tell me who You are! I beseech You and only You. Only You can rescue me… Take away what You will, be it my joy, my friends, my family, or even my life. But let me have You, O God.” (252) This book is full of love. This book recounts deep sorrow. Because love is woven throughout this book, it only makes sense that there is deep sorrow as well. I found tears streaming down my face as I read about the pain Nabeel and his family went through in the wake of his faith in Christ, and realized that certain aspects of that pain continue to this day. I found myself mourning with him, and the countless others who have had to go through the same thing, because they have had to choose between love for God and love for family. How many of us really know the sorrow that comes for fully following Christ? In a culture that loves to tell us that Jesus wants to make us happy, Nabeel showed that following Jesus is often the most painful thing we can do. But, there is a happiness to come; there is a joy in the midst of sorrow. It is better to have sorrow with Jesus than happiness without Him. Not all sorrow is bad. There is another aspect that filled me with sorrow, which I will touch on below. This book has sorrow. This book contains conviction. There are two types of conviction in the pages of this book. One is the conviction of belief. As Nabeel told about his childhood, the family zeal for Islam, the depths of his search to disprove Christianity, and the people who introduced him to the reliability of Christianity, I was faced with convictions that were demonstrated in how people lived. Whether it was Nabeel, his parents, or Nabeel’s friend David, I saw a reminder that what one truly believes will impact how one lives and the decisions they make. But perhaps the more startling conviction for me was the conviction of my own sin, which led to sorrow. I was convicted as I read about Nabeel’s childhood, realizing that the Christians he knew by and large kept him and his family at arm’s length. Nabeel and I are about the same age. Would I have done the same if I had known his family? Speculation aside, who am I keeping at arm’s length now? Who is waiting for someone to love them unconditionally? Am I willing to spend years walking through the hope of Christ with them? Am I willing to speak up, ask questions, and stick around? As Nabeel aptly put it, “Effective evangelism requires relationships. There are very few exceptions.” (118) This book is full of conviction. There are many good reasons to read Seeking Allah, Finding Jesus. Grace, love, sorrow, and conviction are only four of them, the themes that resonated with me personally. Whether you are a Christian, Muslim, or any other self-assigned title, this is a book I hope you read. DISCLAIMER: Blog entries made by individual authors reflect the views of the author and not necessarily the view of other CAA authors, or the official position of the group at large. Apologetics, Book Review, Evangelism, God's View vs. World View, Good Reads, Guest Blogs, Guest Blogs For Action, Life Stories, What Is Truth?